Did you watch a BBC Four programme last week called All Aboard! – A journey down the Kennet and Avon Canal? It was a two-hour trip, filmed from the front of a canal barge travelling at four miles an hour, with no commentary, no music, just the real-time tranquillity of the banks floating past, interrupted only by an occasional cyclist or family on the tow path. There were a few pieces of written information, superimposed onto bridges or the sides of other barges, but otherwise it was just the gentle lapping of the water and the unhurried views. Having been on a disastrous houseboat holiday some years ago, where it rained for four solid days and I ended up falling out with my barge-mates, I had been somewhat sceptical about this programme. But I thought I’d give it a go, just for a few minutes… and I found myself totally mesmerised. Everything just slowed down, and I was drawn in to this sleepy world where two ducks swimming past became a real event, and a swan taking off a spectacular highlight. So much of life these days happens at a frantic pace. We are getting used to a world where everything happens at top speed, and in our rushing and hurrying it is easy to lose sight of the things that matter, or to dismiss them as having no relevance to our superfast lives. This quirky little canal boat programme reminded me how vital it is sometimes to sit still, or walk slowly, and take stock – to appreciate the things, especially nature, around us. 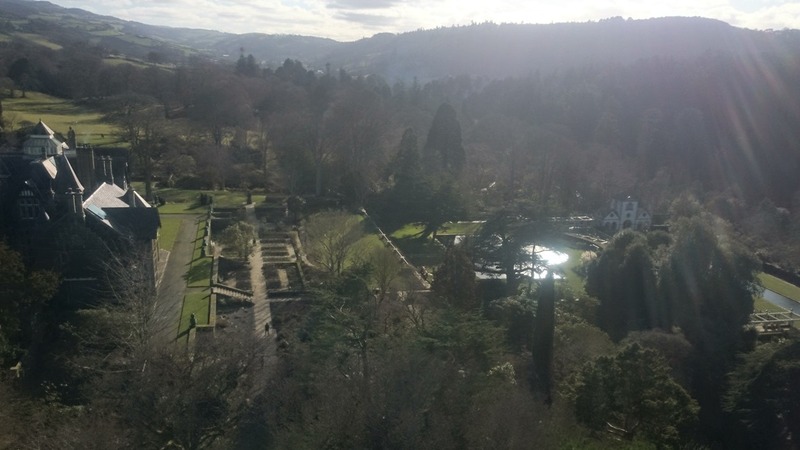 I have just started work here at Bodnant Garden and I’m still pinching myself – I cannot believe how lucky I am to be working in such an outstandingly beautiful place. 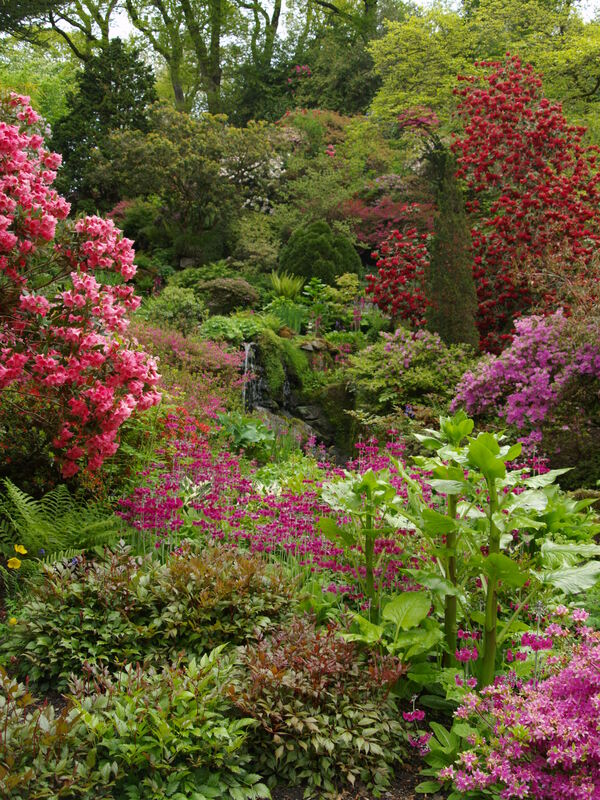 I am amazed at the colours of the rhododendrons and azaleas, and incredulous at the height and age of the trees, which were here long before any of us, and which will outlive all of us. I am humbled by the efforts of the plant hunters and the horticulturalists who created this garden long ago, knowing that by the time their work came to fruition they would be long dead. What a deep connection to the natural world, what incredible foresight and what generosity of spirit they must have had. It’s vital, then, to take time to appreciate each scene. Maybe just for a moment, find a quiet spot in the garden, stand still and just take in the sights, the scents, the sounds all around you. 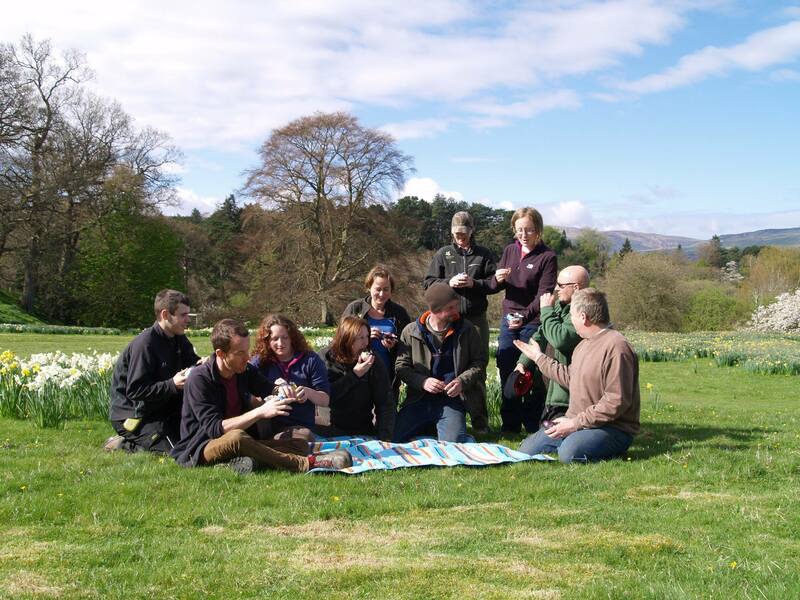 Connect yourself with nature and feel the absolutely incredible power, the life-force that is at work silently all around you, but which we so often miss while keeping an eye on the children, or chatting to our friends, or searching for that special plant. The garden will never, ever be exactly the same again as in that moment. So, like the barge on the Kennet and Avon canal, it is vital, every now and then, to drop into a slower gear, to put life into slow motion, to be still and peaceful for a while, and to take in the beauty around us. In doing this, we will begin to find awe and wonder in the most everyday of scenes, and a deeper and richer connection with the natural world. 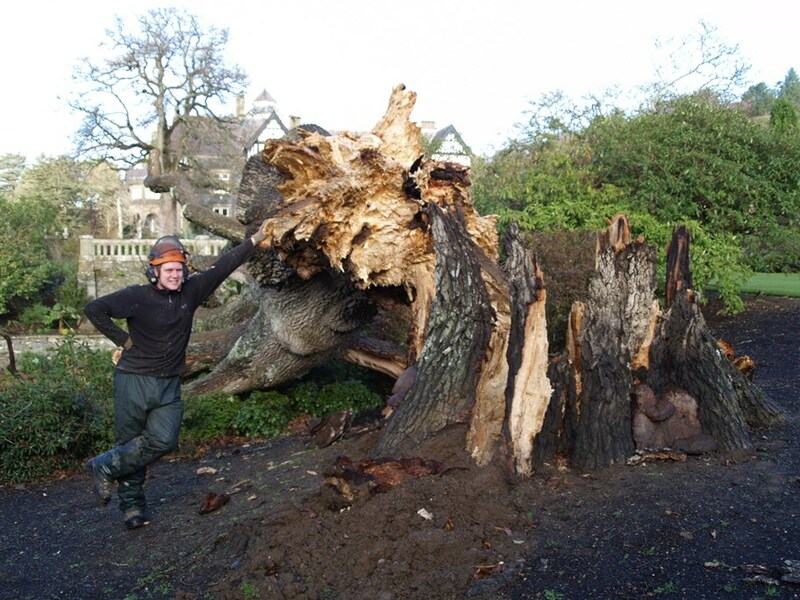 2014 opened on a dramatic note with gales which tore through the garden leaving a number of horticultural casualties, including the mighty oak on the Top Lawn. 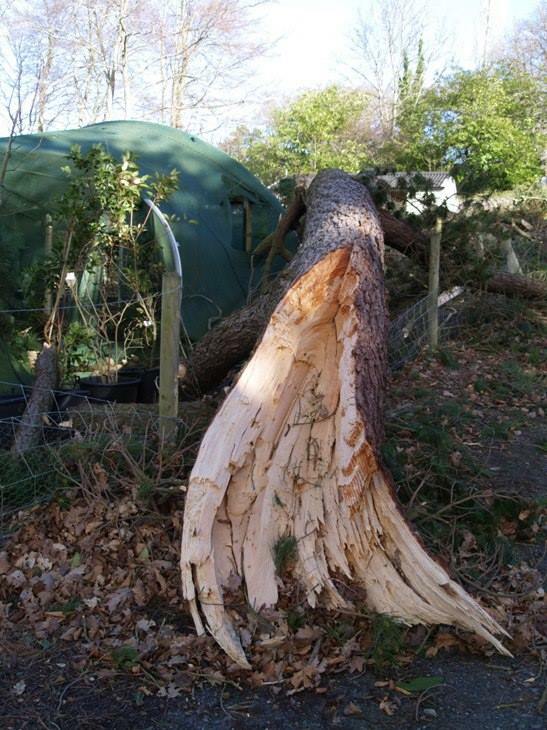 Severe weather kept the garden team busy throughout January and February with chainsaws and chipper – one fallen pine took out a greenhouse polytunnel (below right) and the giant blue cedar on the Lily Terrace lost several limbs. 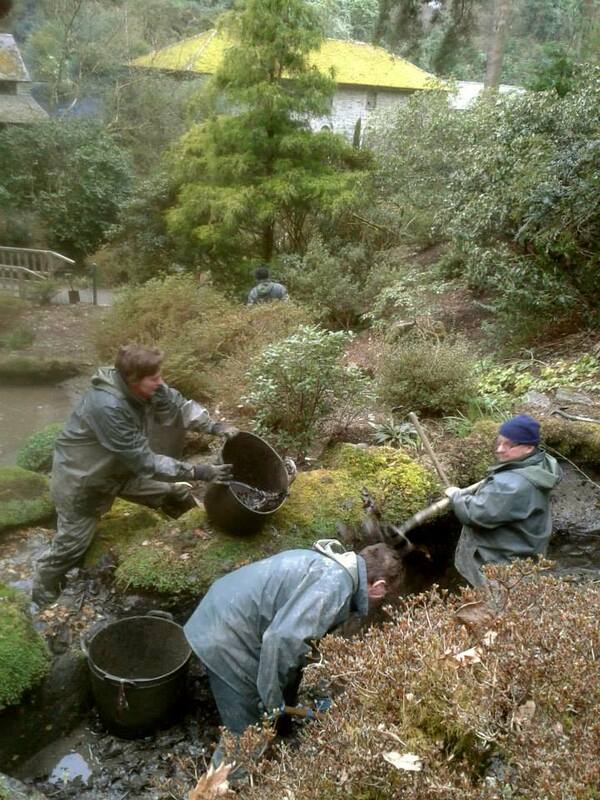 February was also time for the annual stream clearance, when the watercourse running from the top of the garden down to the Dell gets mucked out by hand (below left). 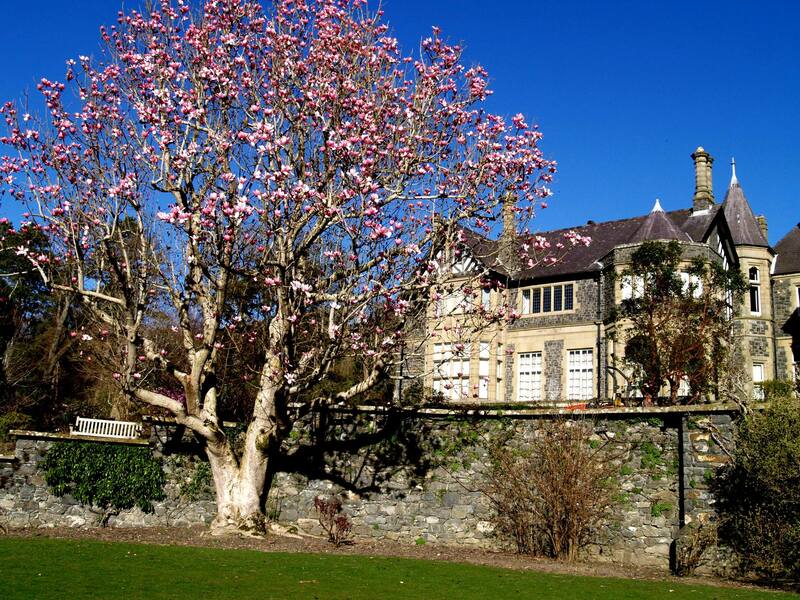 After a stormy start to the year we were rewarded by a balmy spring with many flowers appearing early, including this Magnolia campbellii on the Croquet Terrace which gave the best show anyone can remember seeing for a long time. Then before we knew it the daffodils were out and it was Easter. It was a really busy one this year, with lovely weather bringing in visitors who lapped up our new offerings – a refreshment kiosk in the Dell, new picnic areas and even new loos. 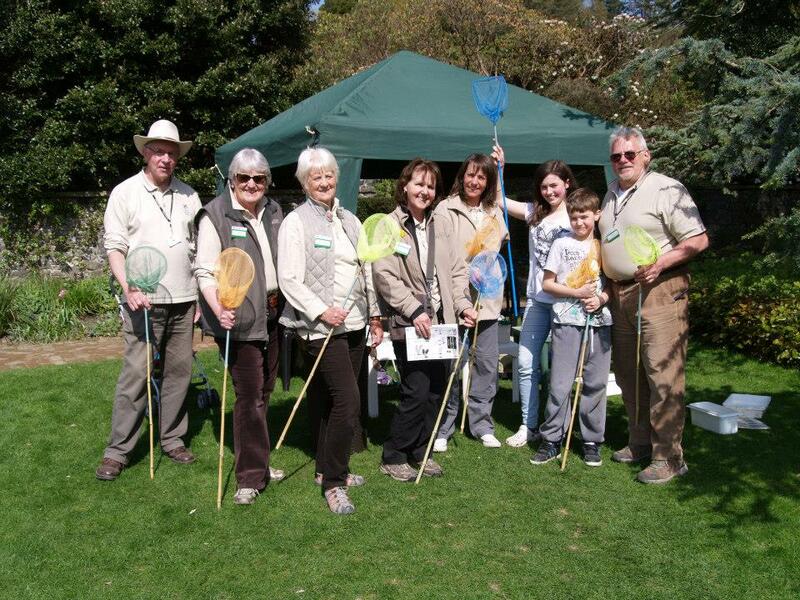 Volunteers really took the family events programme by the horns too, and managed a host of activities including hugely popular pond dipping sessions. 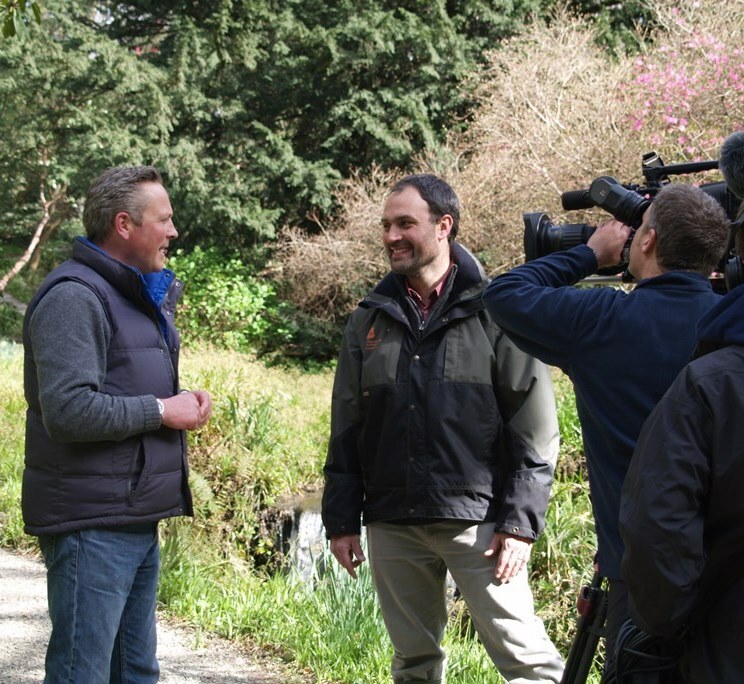 In April we had two visits by BBC television crews. 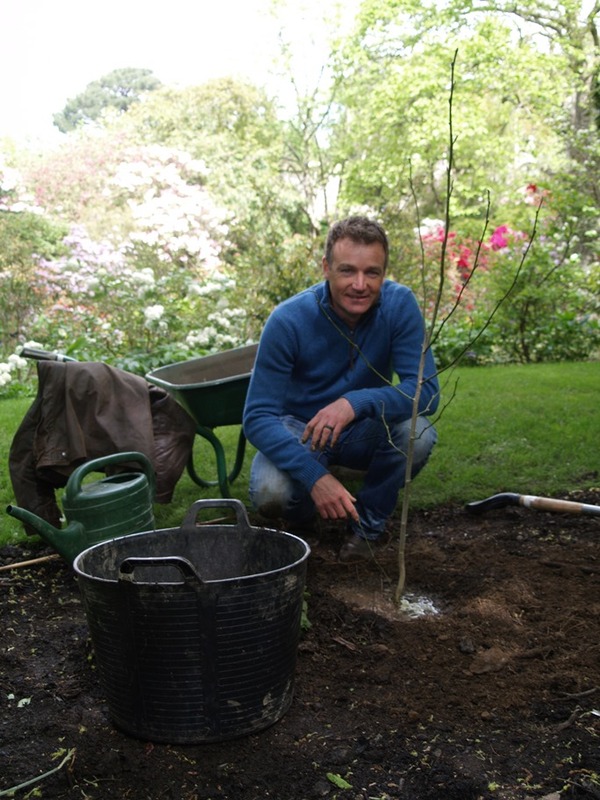 Young garden designer Mathew Childs came to Bodnant looking for inspiration for his Chelsea Show garden, which was featured in the programme Countdown to Chelsea. 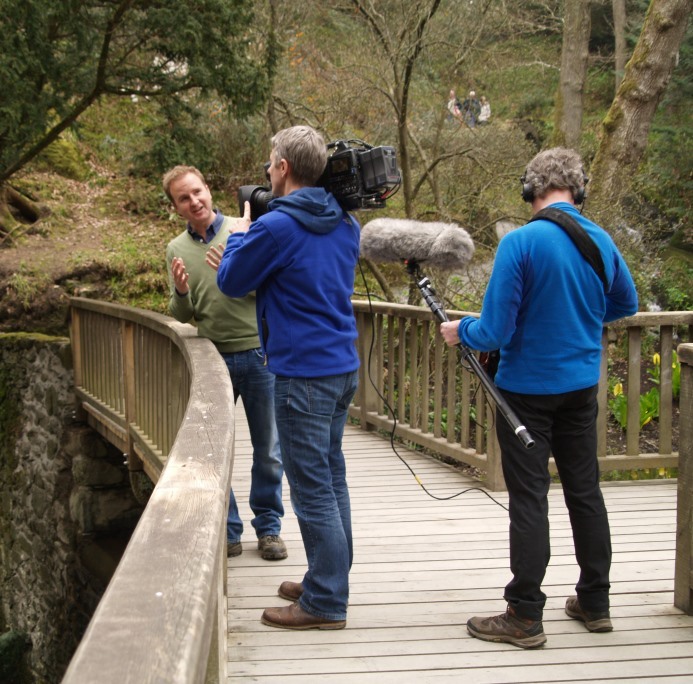 Chris Beardshaw also dropped in to film for the new series of The Great British Garden Revival – which starts on January 5th, so don’t miss it! 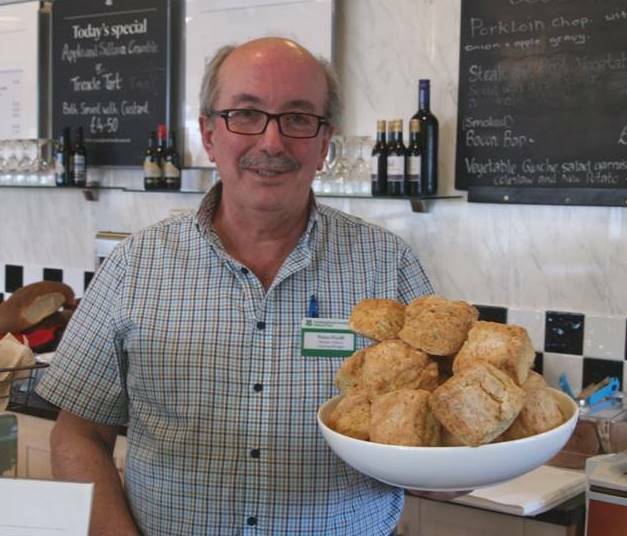 But more importantly, in the Pavilion our famous cheese scones were back on the menu. Catering mananger Pietro (left) brought back the tearoom favourites after a deluge of requests from customers on comment cards. You asked – we delivered. May was buzzing with activity…there was the small matter of the swarm of bees that decided to make the old head gardener’s house a home. 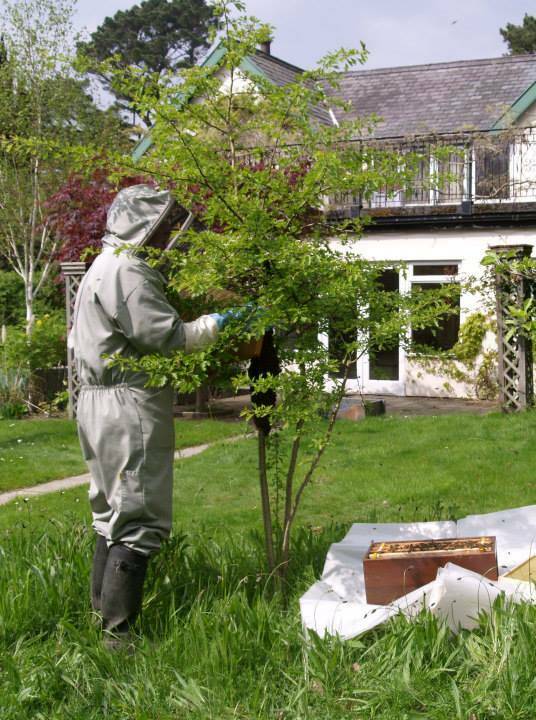 Beekeepers from Bodnant Food Centre came to the rescue on that occasion. 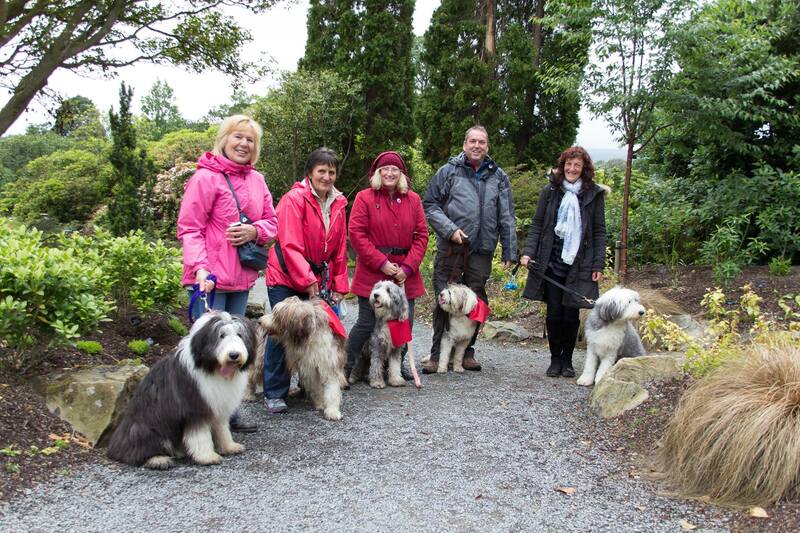 There was also the pitter patter of paws to be heard again as we opened to dogs for the summer season. 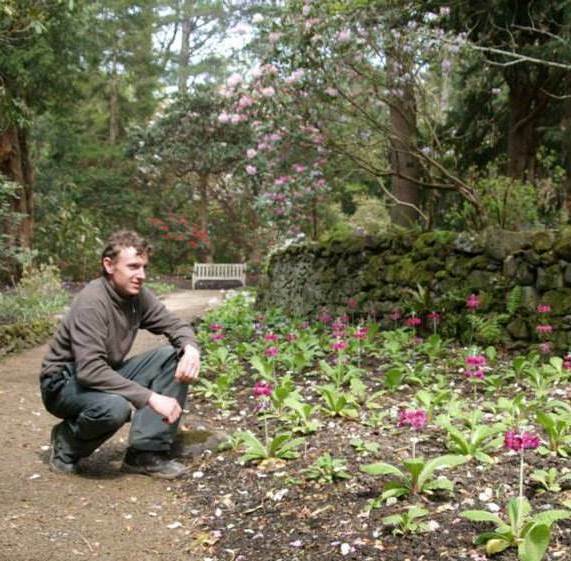 It was also the month we opened The Prim Path, an old walkway in the North Garden lined with native and exotic primulas, after a two-year renovation (seen below being inspected by acting head gardener Adam). 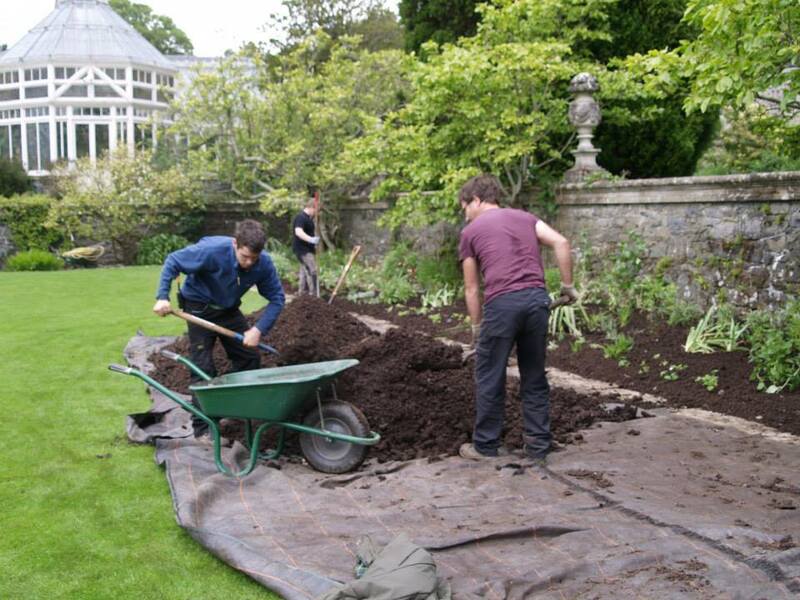 Elsewhere students Nathan, Harvey and Huw were busy renovating the Tennis Lawn herbaceous beds. 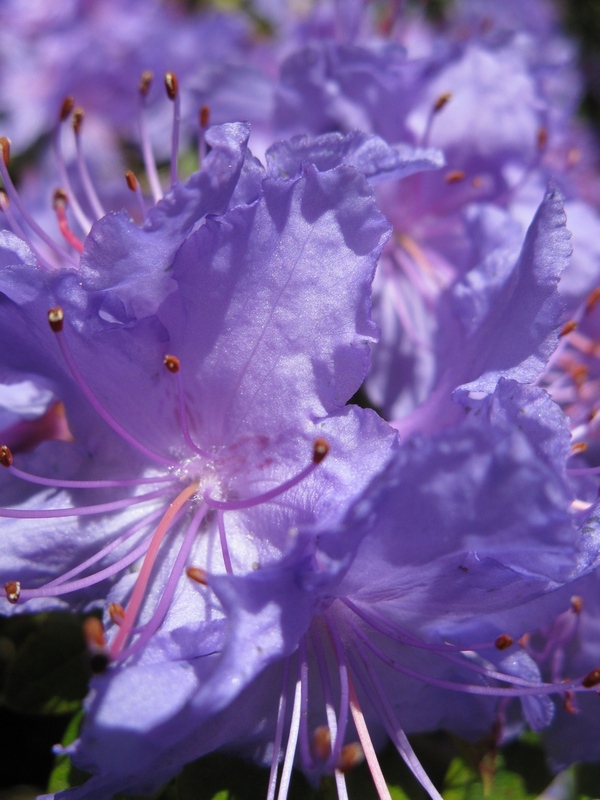 In May and June we celebrated one of our finest assets -rhododendrons – with Rhodofest, a month long series of walks, talks and workshops. 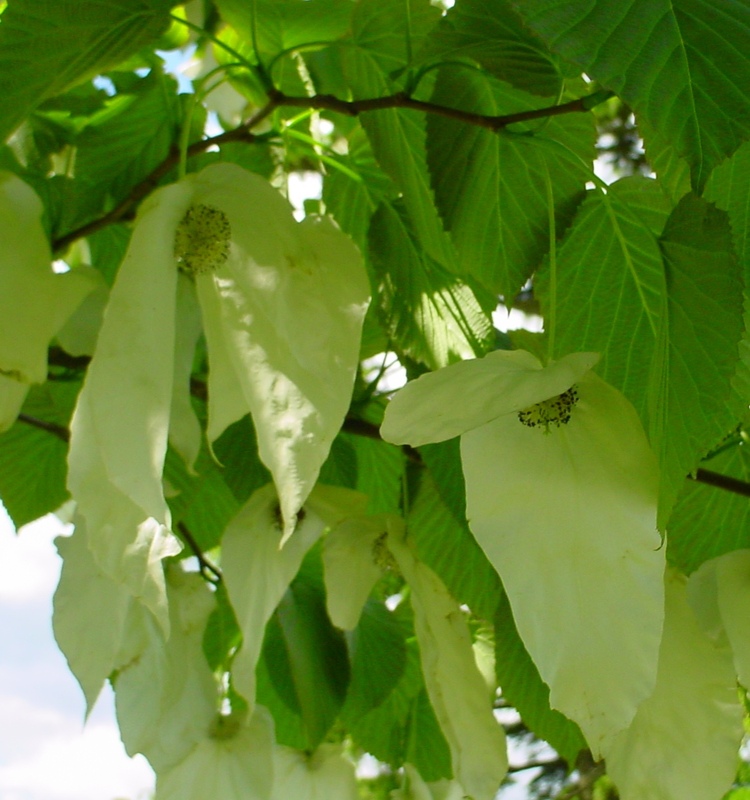 We were also busy alerting visitors to the early appearance of the famous Hankerchief Tree which was flowering before its time like many other plants in the garden. 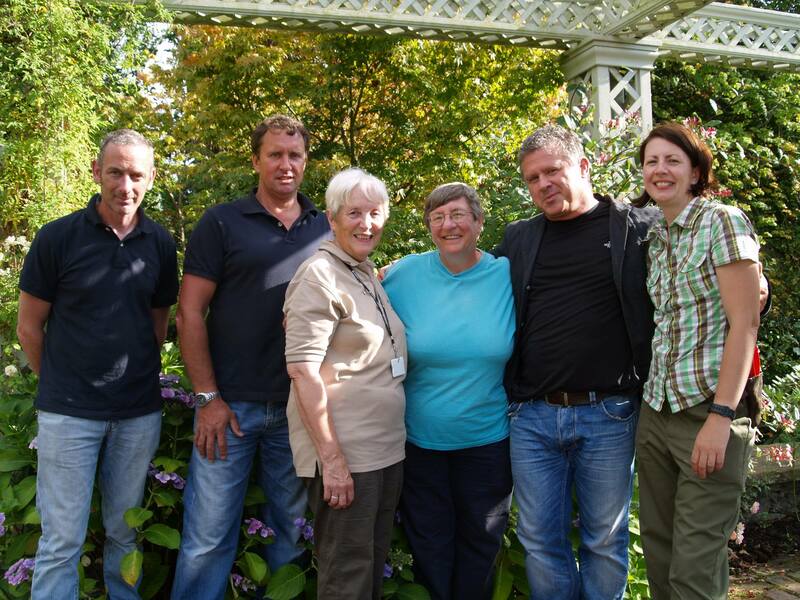 In June we had the first of several visits by a BBC crew filming a new series Glorious Garden from Above, with Christine Walkden. 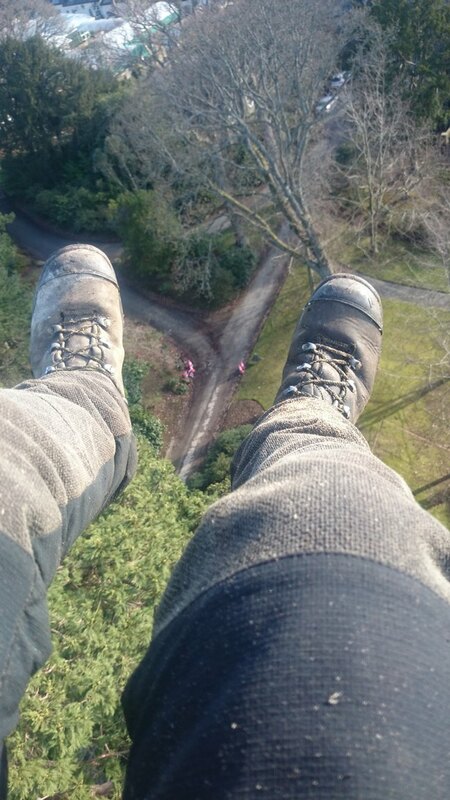 The programme featured appearances by gardener Fiona, volunteer Phylis, along with Andrew Lloyd from the craft units and his team Cameron and Iain (seen above). It was aired in November and was a great tribute to the garden. In July the roses were out and we celebrated the centenary of the garden’s Italianate terraces (seen above), which were built between 1905 and 1914 and completed just before the Great War. It was an opportunity to stop and remember those gardeners, stonemasons, carpenters and others who created our now famous terraces, who went to war and did not return home. 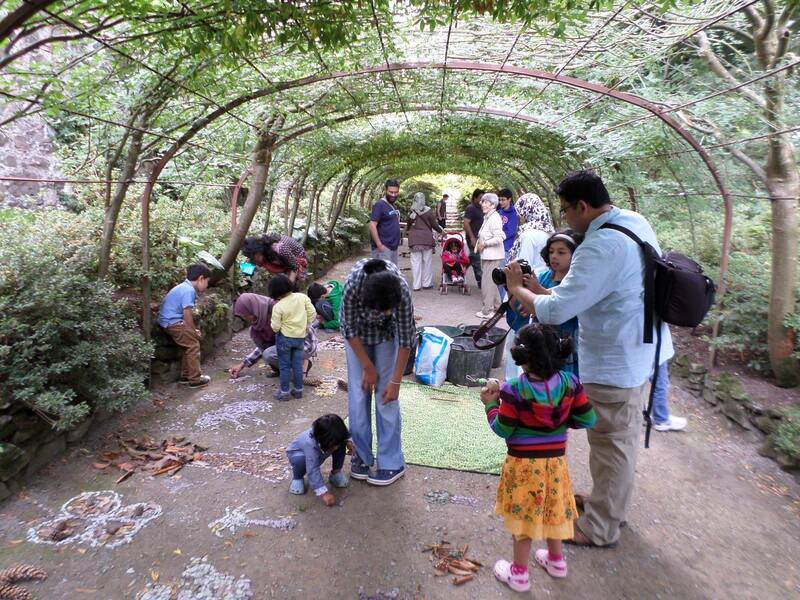 July was also the start of our Grow wild summer events – a daily offering of crafts, nature trails, pond dipping, seed sowing and other garden activities which drew families from far and wide, culminating in a Wild Wood Weekend in August. 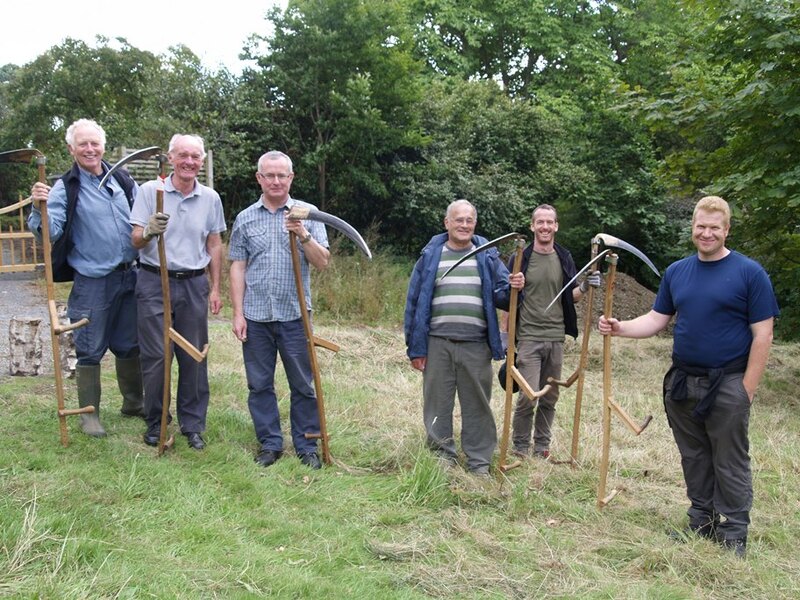 In August we also ran a scything workshop when gardeners, volunteers and visitors were able to try a bygone art of grass cutting (right). Most who took part were pleasantly surprised…at the end of the day more ground was covered and fewer aches and pains encountered than people had expected! 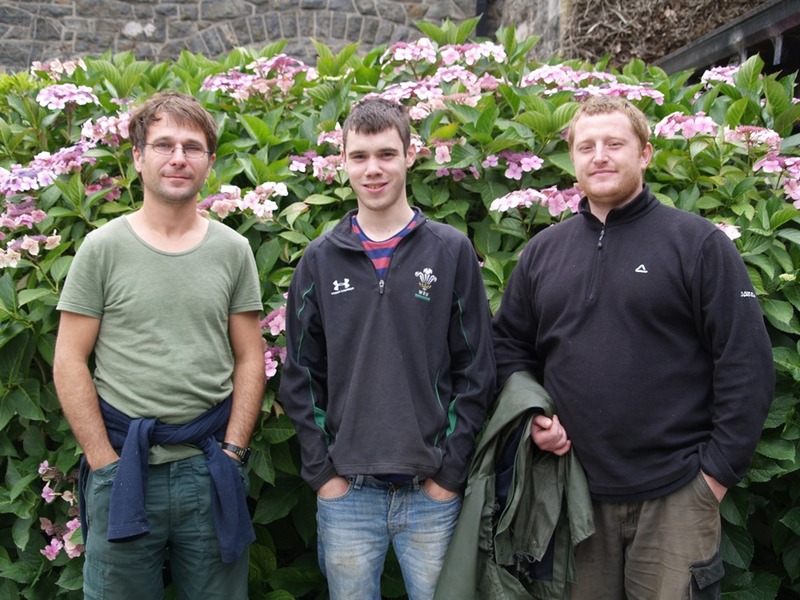 In September it was all change for the students on our Heritage Horticulture Skills Scheme – Harvey, Huw and Nathan (above). 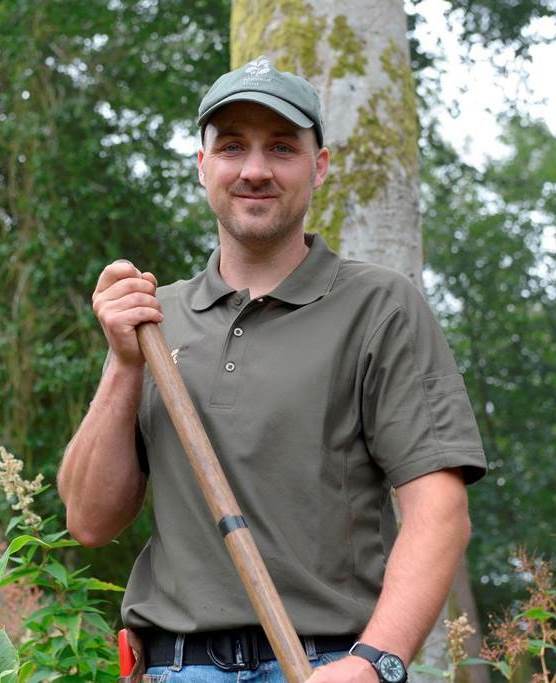 Harvey and Nathan secured full time positions in the garden and Huw was taken on at Bodnant Garden Nursery (well done lads). 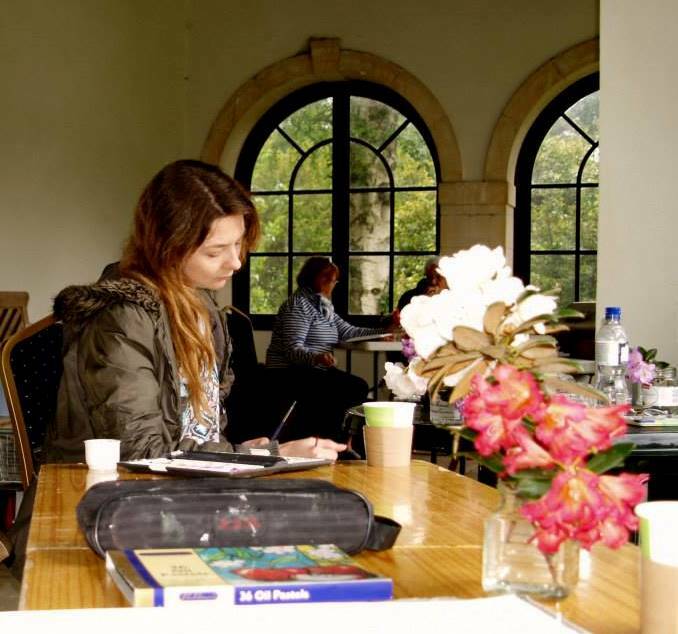 In their stead we welcomed three new students, Jess, Lee and Jette (below). 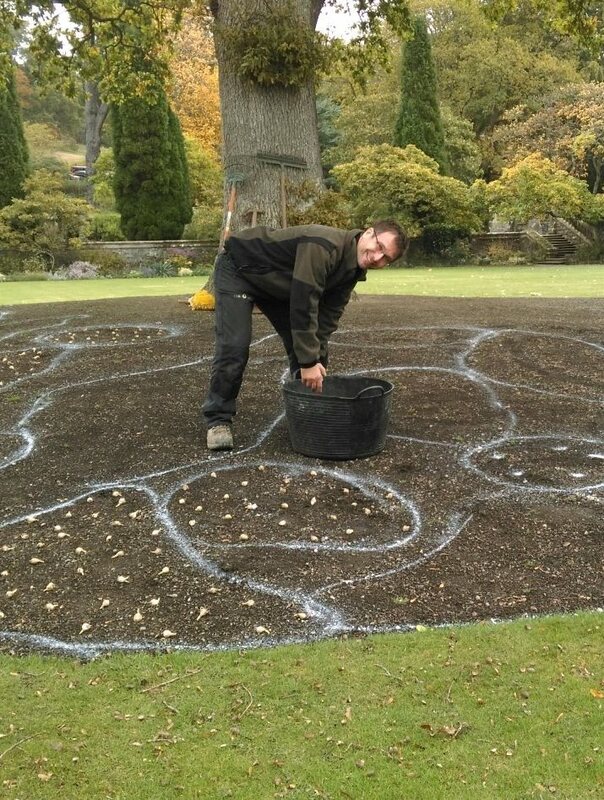 Sadly Lee had to leave us (best wishes Lee) but Jess and Jette are going strong and working on a renovation of the large Top Lawn bed, left empty by the fallen oak at the beginning of the year. 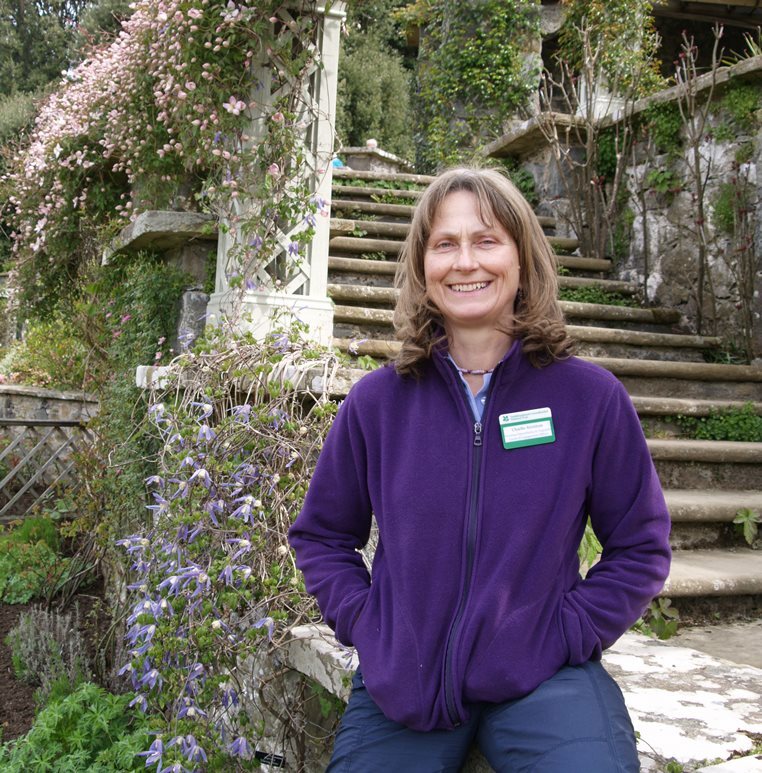 October brought more change on the staff front, not least the long-awaited appointment of a new head gardener after an 18-month search. 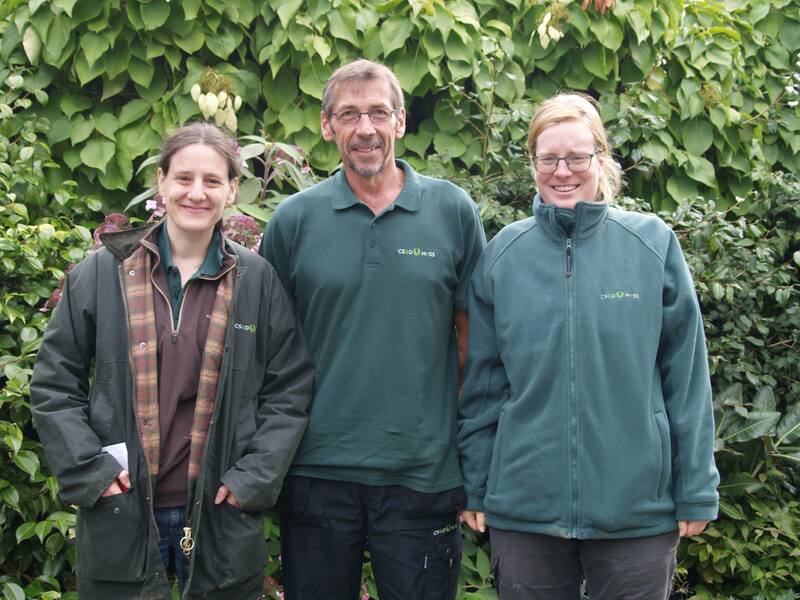 John Rippin (below left), currently head gardener at the National Trust’s Castle Drogo in Devon, will be joining us in January. We also opened a new NT shop and welcomed Daniel, Gwenda, supervisor Kate, Louise, Brenda and Laura to the fold (below right). 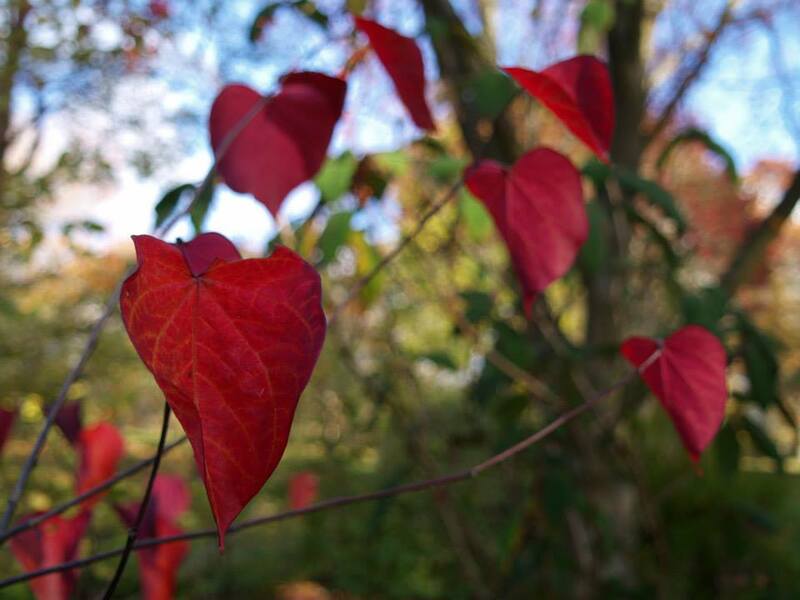 The mild weather continued giving a long and late autumn display of colour. Trees hung onto their leaves and flowers continued to flower (some salvias were still going in December!) 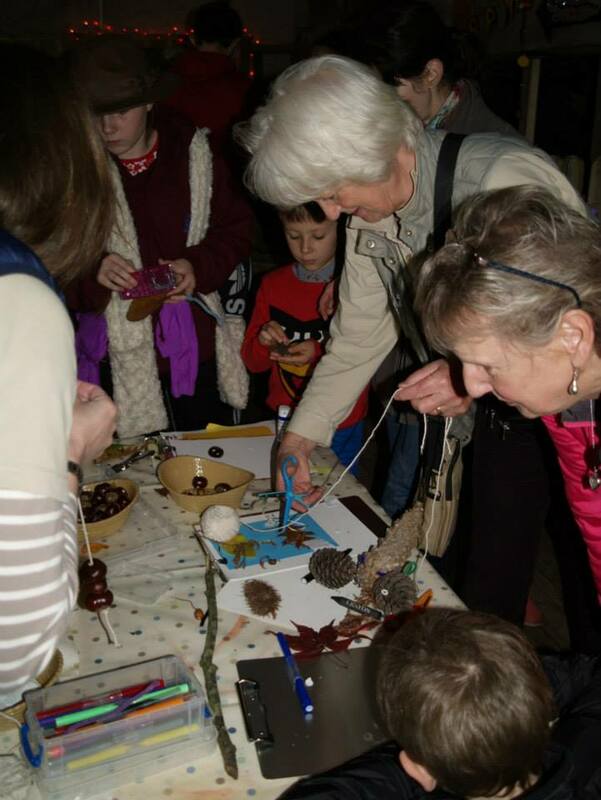 Half term was a big hit with family visitors, with volunteers turning the Elves’ Workshop in The Dell into a Halloween and autumn craft-making emporium. In November gardeners planted up the bare bed under the oak on the Tennis Lawn with a seasonal display of bulbs – and yes, due to the warm weather the snowdrops are already appearing! 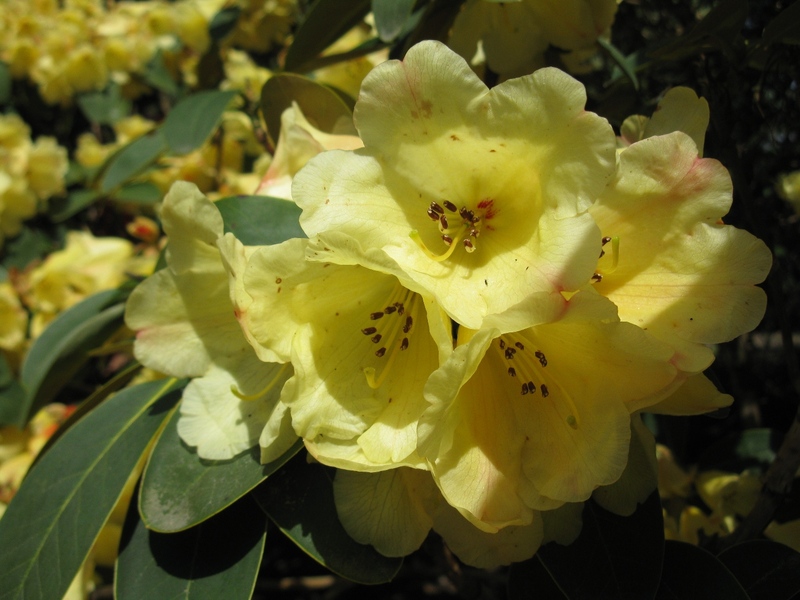 Elsewhere in the garden other plants bloomed earlier than expected including the Rhododendron Nobleanum (above right). Even the dwarf daffodil, Narcissus Cedric Morris, could be spotted in the Winter Garden. 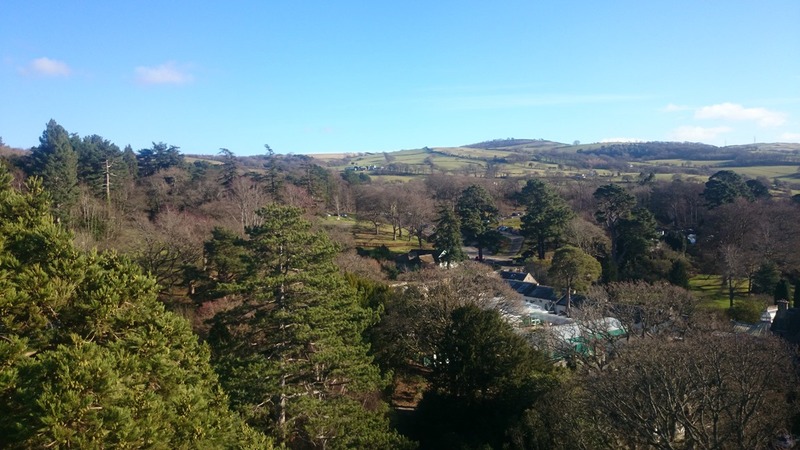 And so to December…it’s only the second year we have opened during the winter and staff and volunteers worked hard, with our neighbours Bodnant Garden Centre, to give visitors a great Christmas day out. 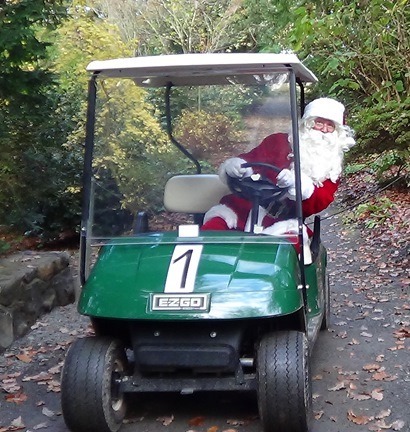 We had Winter Garden Walks, festive food at the Pavilion and Magnolia tearooms plus a brazier and refreshments in the Dell, a Santa’s Grotto…but the big hit was our Elves’ Workshop. Fashioned out of a redundant room in the Old Mill by our volunteers, it drew around 800 visitors in the four weekends leading up to Christmas. In fact visitor numbers have sky-rocketed this year and we’re predicting a figure of around 192,000 by the end of the financial year (February), compared to 175,000 the previous year – no doubt a mark of the fine weather we’ve enjoyed (in spite of a stormy start) but also a tribute to all the hard work of staff and volunteers throughout 2014. We’ve got another big year to look forward to, with a new head gardener joining the team soon and the opening of The Far End in March. So Happy New Year everyone – and bring on 2015! Our four-legged friends will be straining at the leash to take part in a special upcoming event – a fundraising sponsored dog walk on Wednesday, June 4. 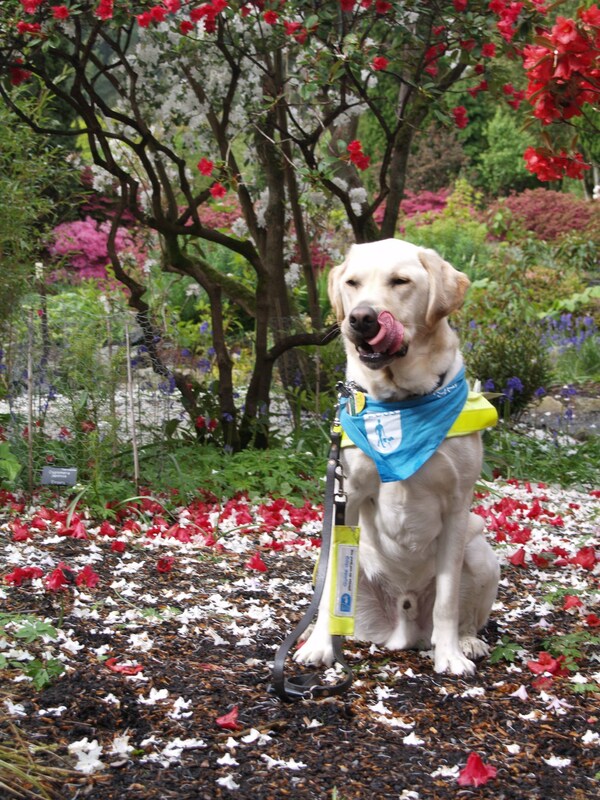 It’s for Dogs Unite, a campaign by the national charity Guide Dogs, to raise support for the 4,700 canny canines who make a life changing difference to blind people in the UK. Sponsored walks will be taking place all around the country. 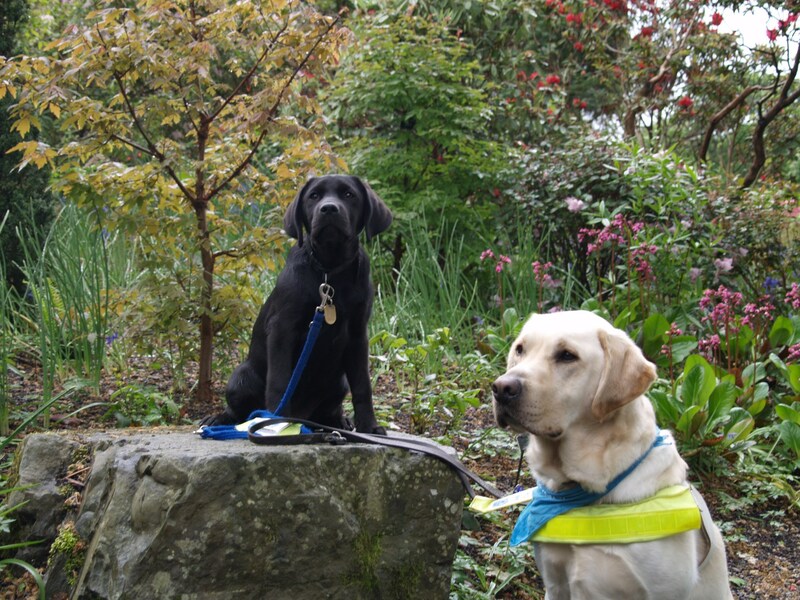 Guide dogs Cherrie and Pete (seen above in his fetching blue collar) came into the garden recently with their owners to check out the special route for the walk – and as you can imagine they found more to see and sniff than you can shake a stick at. 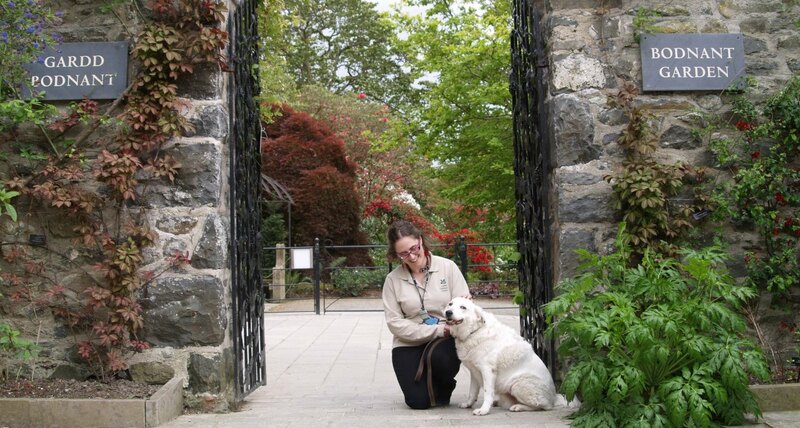 Bodnant Garden recently opened its gates to dogs and now welcomes walkers every Wednesday night in summer (May to August) and in winter all day on Thursdays, Fridays and Saturdays. 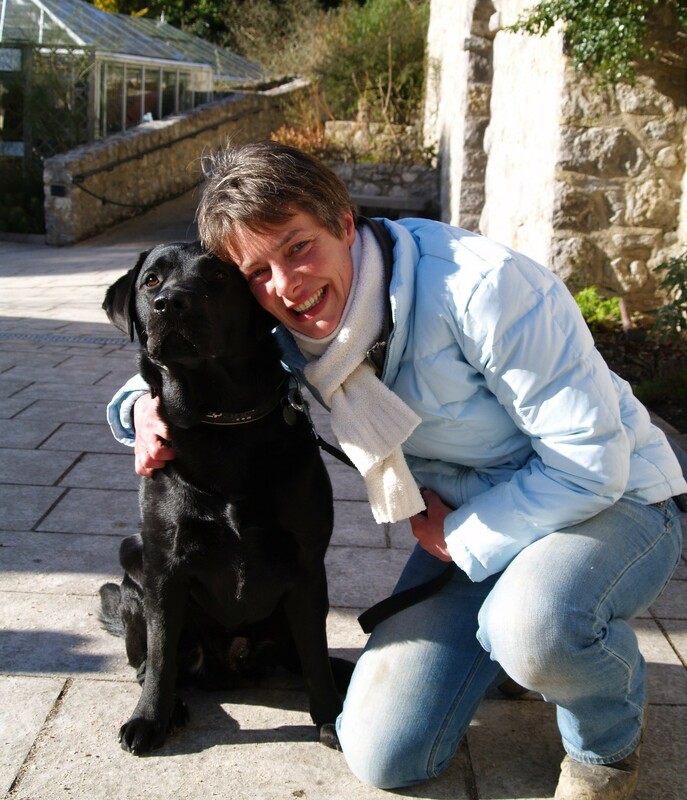 Of course guide dogs play an even greater role in their owners’ lives, which makes out June 4 evening walkies a bit special. The event starts at 5pm until 8pm with last entry at 7.30pm. As a special thank every furry fundraiser receives a special doggy goody bag. 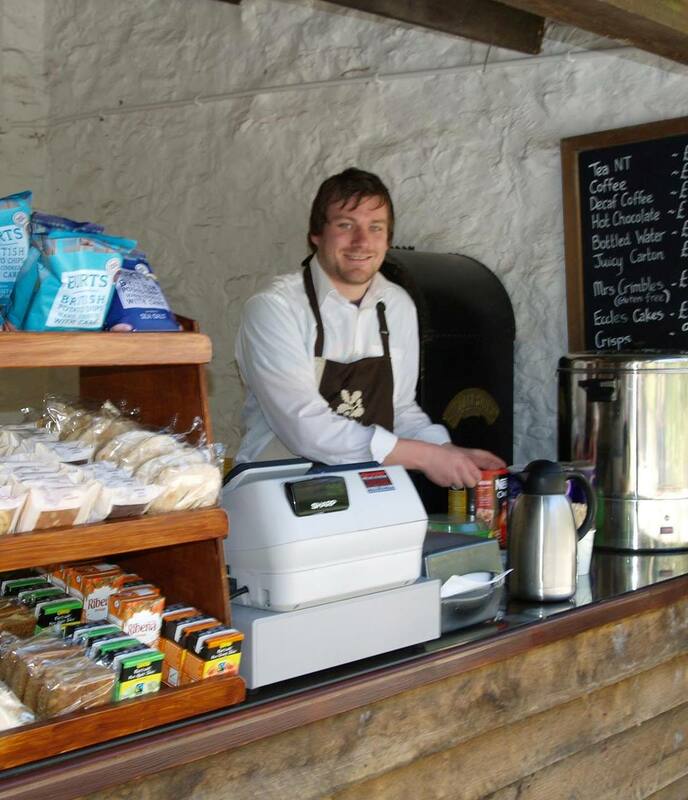 The kiosk in The Dell will be open on the night serving refreshments for visitors and their dogs. 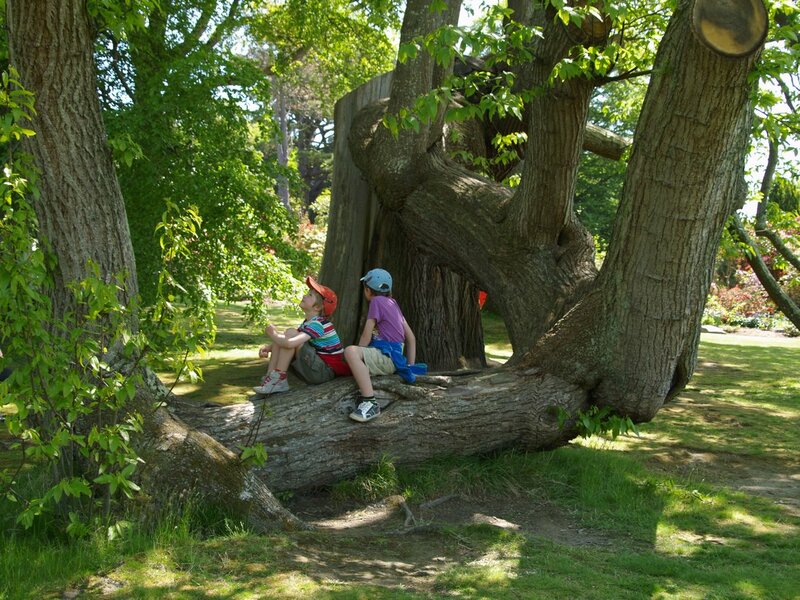 Ever looked up into the canopy of one of Bodnant Garden’s giant trees and thought about climbing it? 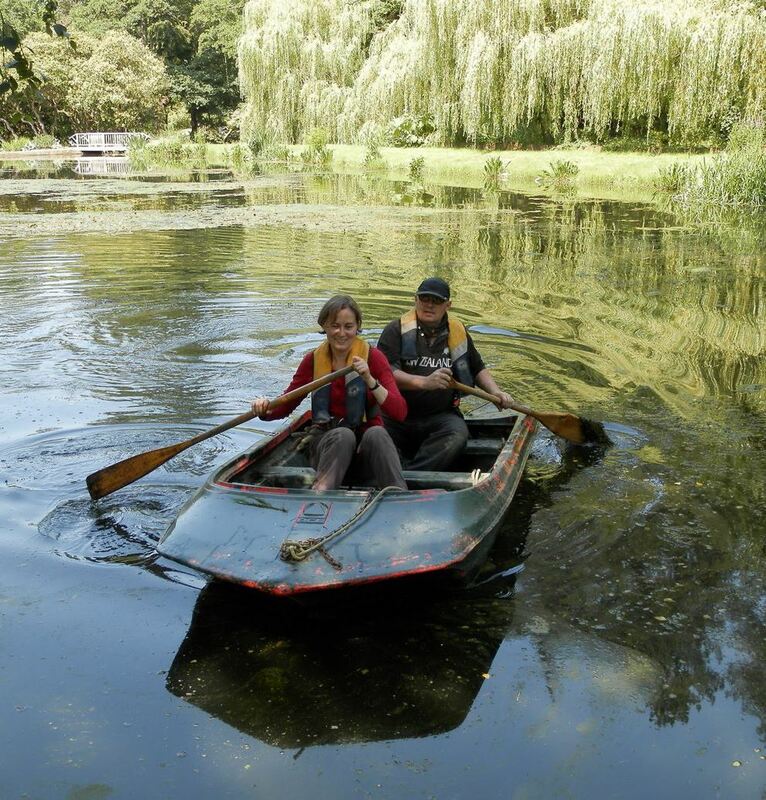 Ever wanted to whip a fishing net under those water lilies to see what’s living underneath, or fancied getting your hands dirty with the gardeners? Go on, admit it…chances are you’ve thought about it, because for most of us our love of gardens started with a love of outdoor play. Which is why we’re inviting youngsters to come along and do just that this summer. 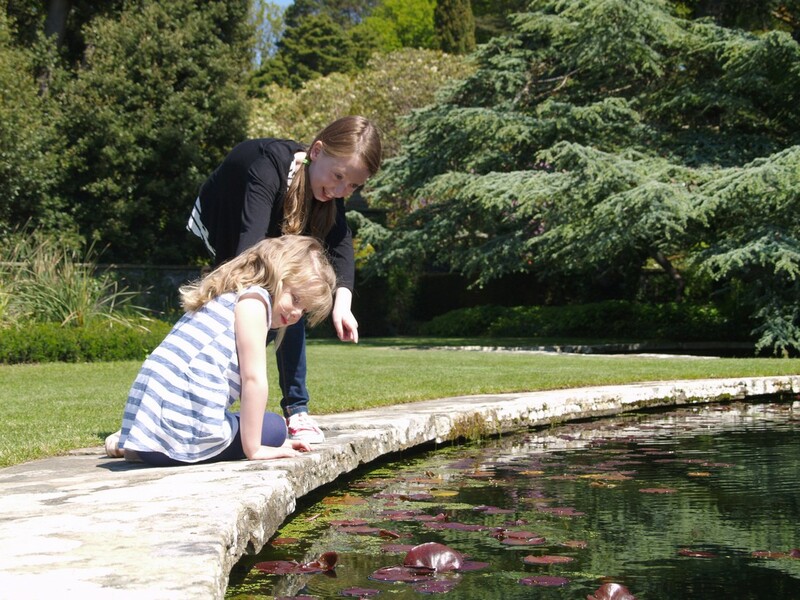 We’ve got seven weeks of holiday fun for families lined up with Grow Wild, Bodnant Garden’s first ever, tailor-made events programme jam-packed with activities to entertain, educate and inspire our younger visitors, and hopefully get them closer to nature. 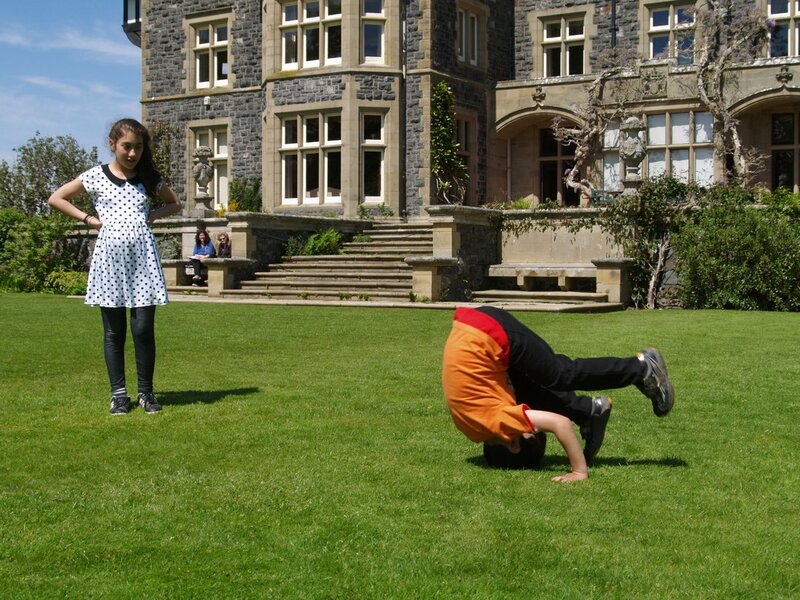 The National Trust is spearheading a drive to get children loving the great outdoors with a campaign called 50 Things To Do Before You’re 11 ¾. It’s all about the simple childhood pleasures like jumping in a puddle, rolling down a hill or making a mud pie. 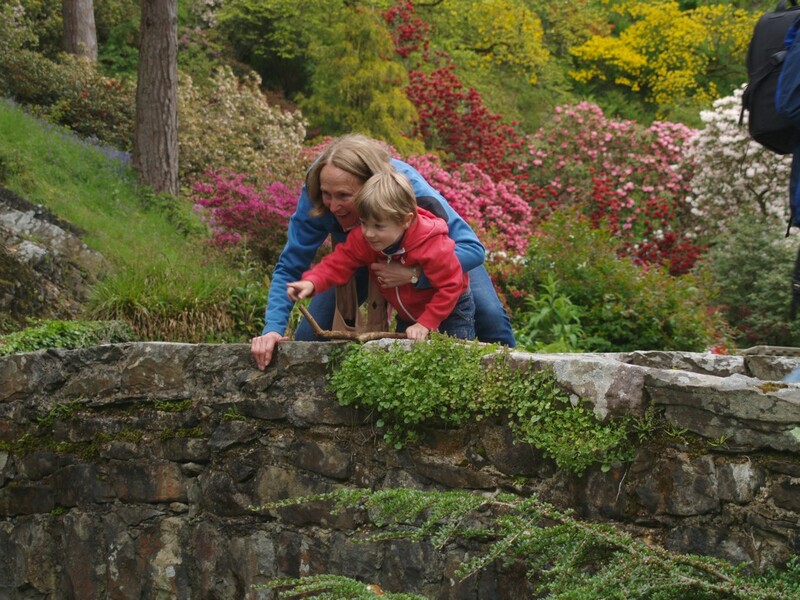 At Bodnant we’re doing our bit by sharing the joy of our beautiful garden with today’s techno-savvy younger generation. As part of the Grow Wild summer we’ll have regular garden activities every weekday afternoon from July 22 to September 6, plus some special weekend events. 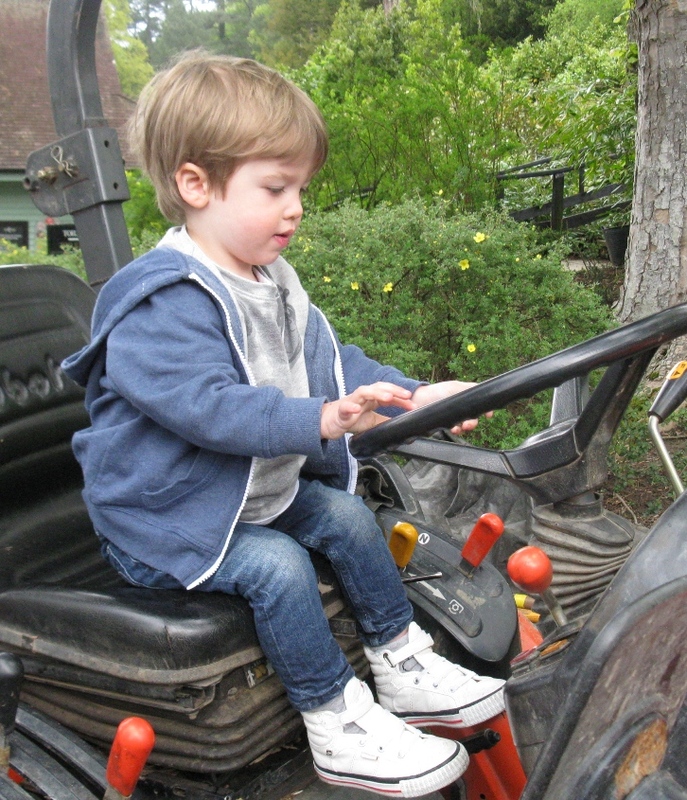 Mondays are Garden Apprentice days when families can join in with the gardeners on a whole range of daily tasks. 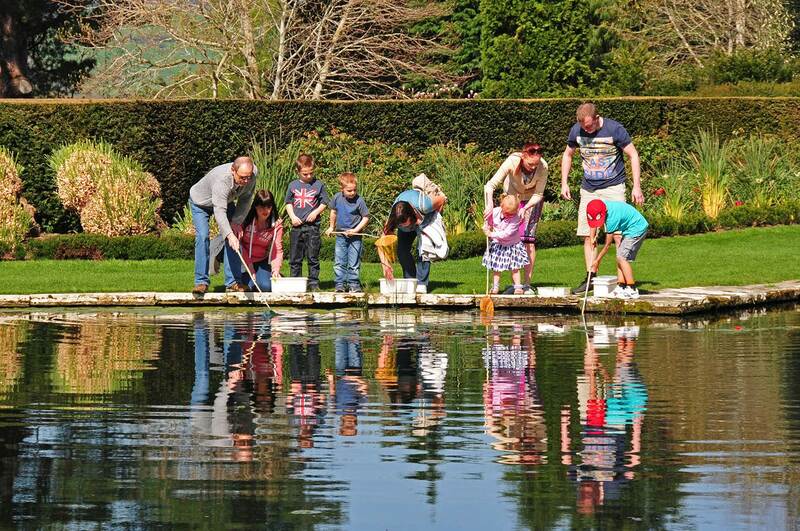 Tuesday is Pond Dipping day when you can do a bug hunt in the Lily Terrace pond. 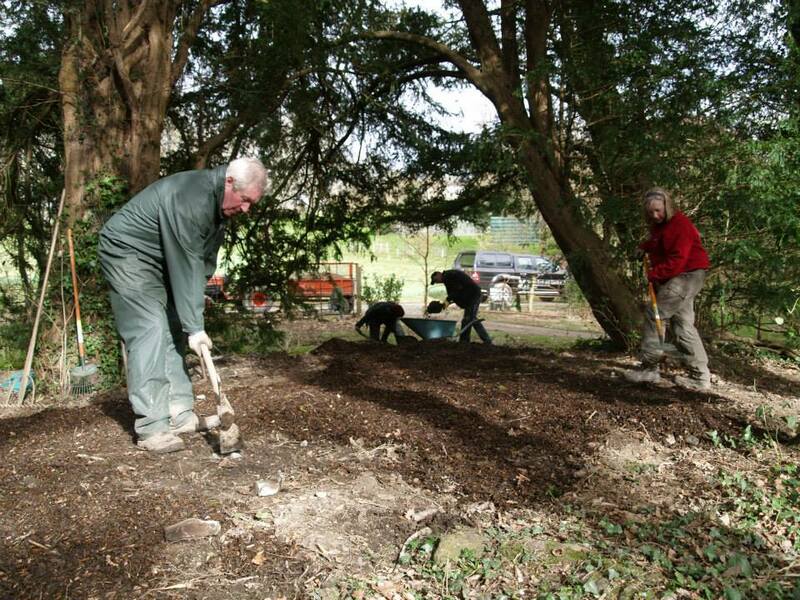 Wednesday is a biggie – in the afternoon you can muck in at our vegetable plot and Plant Your Own Dinner and in the evening come along to late night opening for a wildlife walk, followed by hot dogs and marshmallows in front of a fire in The Dell. 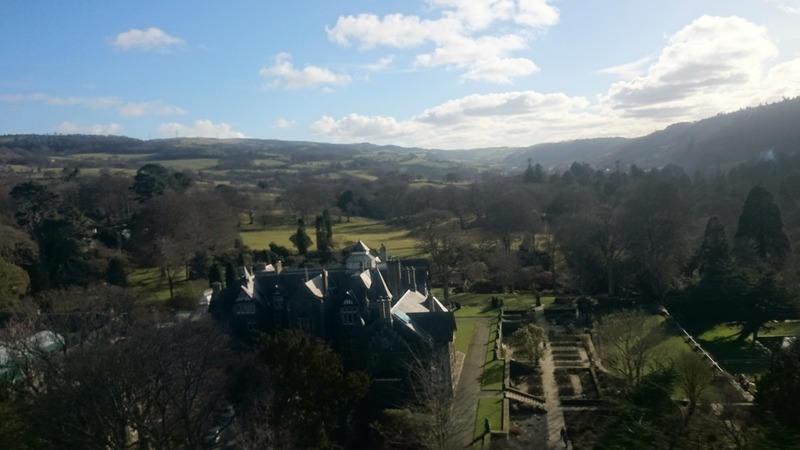 Discover Secret Bodnant on Thursdays, when private areas of the garden will be open to explore, and then on Friday have a go at Garden Games such as quoits and croquet on the lawns. In addition to all this we’ve also got a Craft Week from July 22-26 and a Wild Art Week from August 19-23 with themed activities by visiting artists taking place around the garden. 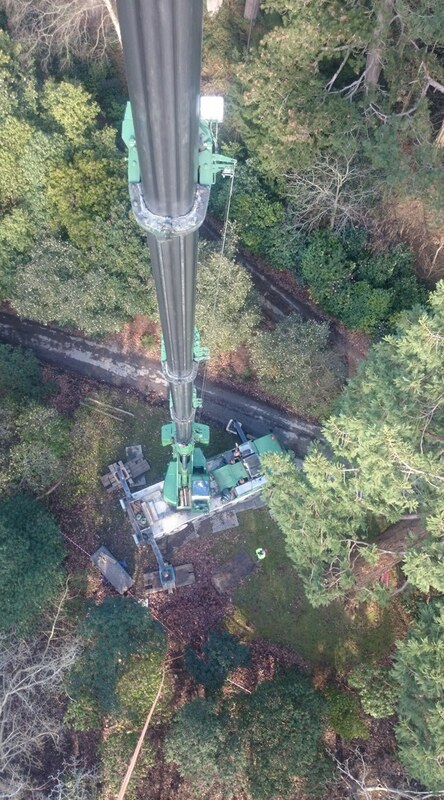 The highlight of the summer will be two extra special weekends; August 3-4 is Tree Climbing, an opportunity to scale a Bodnant Garden tree with the professionals and watch demonstrations of tree felling and wood carving by our arborists; then on August 17-18 it’s Mega Machinery when all our vehicles and equipment will be on show in the Old Park for visitors to see and try. 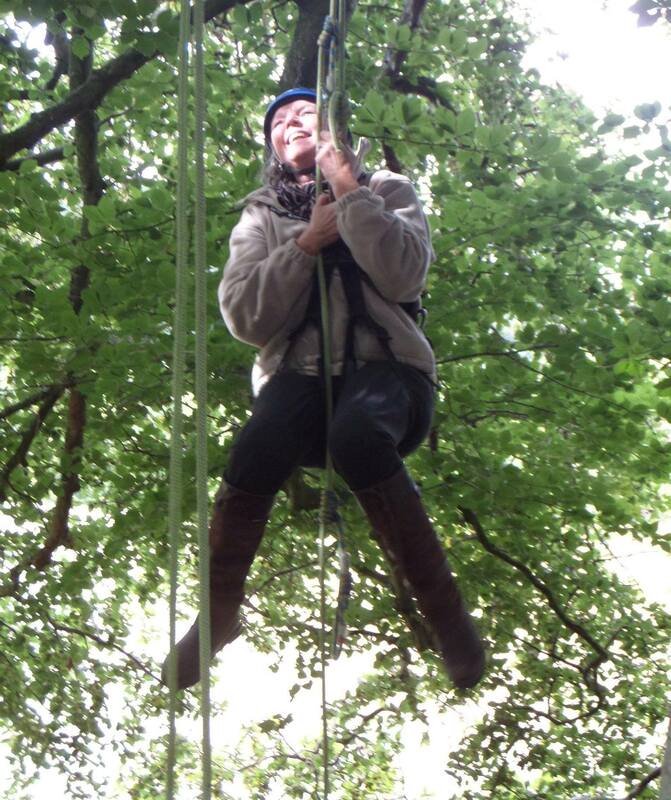 All of these events are free apart from Tree Climbing run for us by The Big Tree Climb Co which is pre-bookable at a cost of £12.50. Otherwise normal garden admission charges apply, just drop in on any of the activities that take your fancy. 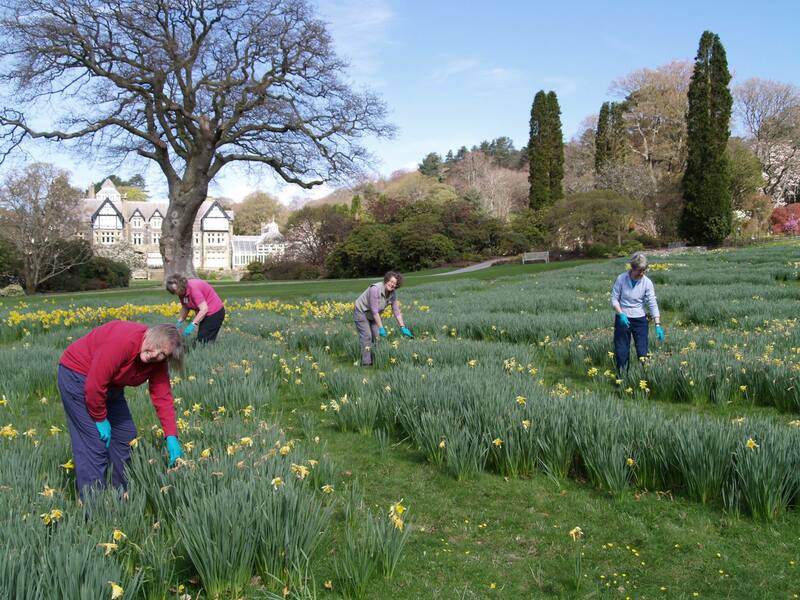 For details of all these events see our website www.nationaltrust.org.uk/bodnant–garden or check our Facebook page https://www.facebook.com/#!/BodnantGardenNT but most importantly come along and join in! 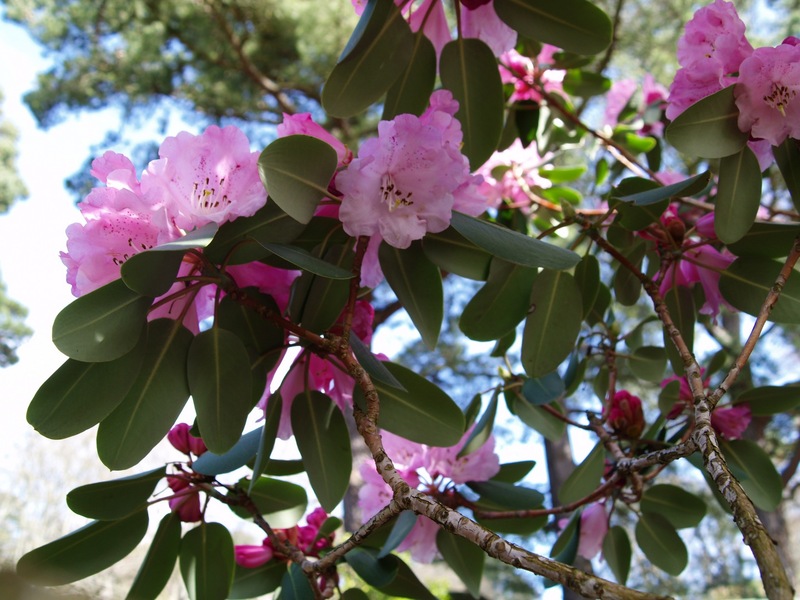 ‘Transforming’ is how visitor Rosie Massey describes May at Bodnant, when the rhododendrons burst into life invigorating the garden…and the heart. I gaze dreamily on the little stream as it gurgles noisily down the Welsh hillside to the valley bottom, dancing and cascading through narrow twisting channels hewn out of the surrounding earth. The water tumbles over rocks and stones covered in spongy moss which seems to be there deliberately to impede the water’s impatient journey. It rushes between banks of lush green foliage, surrounded by an abundance of beautiful trees and shrubs. The stream races on in its timeless quest to reach the bottom of the hill, as shafts of sunlight slant and sparkle throughout the tall majestic trees and reflect in the cool, clear, tumbling water. 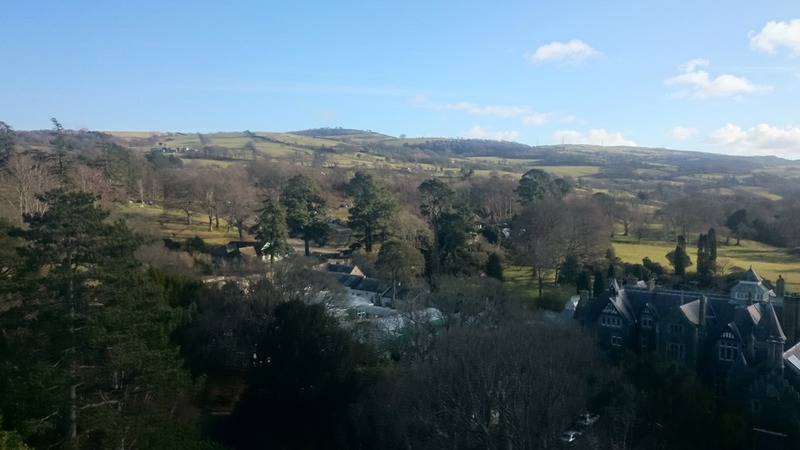 Birdsong, mostly sweet but occasionally loud and shrill, echoes through this beautiful hillside garden, a garden for all seasons, which despite crowds of garden lovers meandering through seems to retain utter peace and silence. It is mid May when I visit this time and out in the open away from the woodland swathes of beautifully manicured, bright green lawns create a backdrop for the kaleidoscope of the richest colours imaginable. 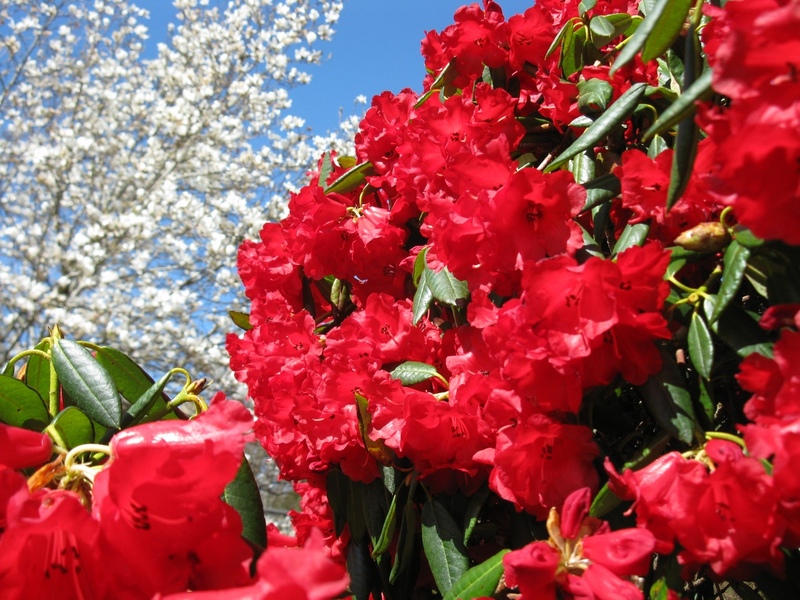 Gentle sunshine bathes the great banks of azaleas and rhododendrons which compete with each other, ablaze in every shade and spreading out like a giant tapestry in all directions. Not just a glorious profusion of colours but also of rich, tantalising scents, the perfume hanging heavily in the warm balmy air of this late spring day; an amalgamation of hundreds of fragrant blooms, no one scent distinct from another but overpowering in its headiness. I want to smell each flower to identify each wonderful, exotic scent, then bottle it up and create one wonderful perfume I can wear. I continue all along the woodland path but at the bottom now, on a level with the stream. From here the tall trees create a giant lacy umbrella high above me, blocking out most of the sunlight now, as the leaves sigh and whisper in the still, quiet air, creating a cool and gentle breeze. I wander slowly through this magical, peaceful place; transformed, any worries forgotten. I stroll on through the garden, sitting occasionally to rest for a while, enjoying the coolness of the trees or the warmth of the sun. 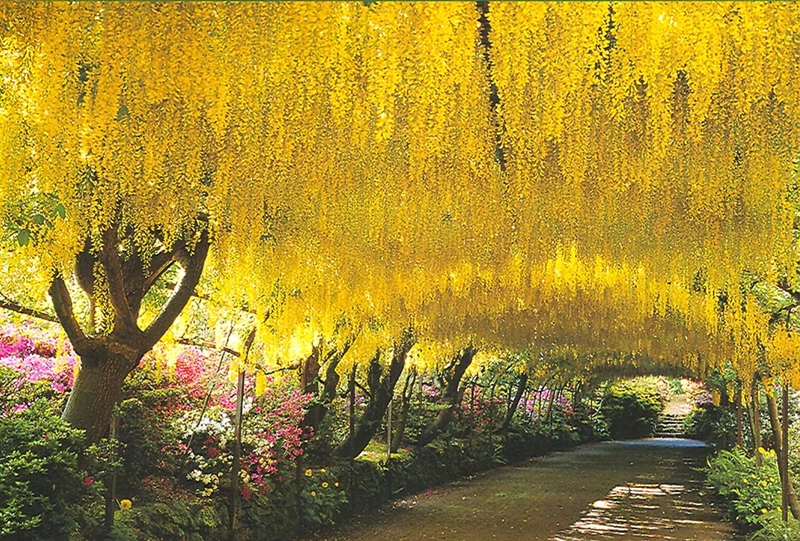 Gazing quietly around me and in no hurry I relish every moment here, until I finally make my way to the spectacular Laburnum Arch; a framework drenched in beautiful, golden yellow Laburnum blossom which hangs and drapes over the frame like a delicate lace curtain as one wanders through its length. 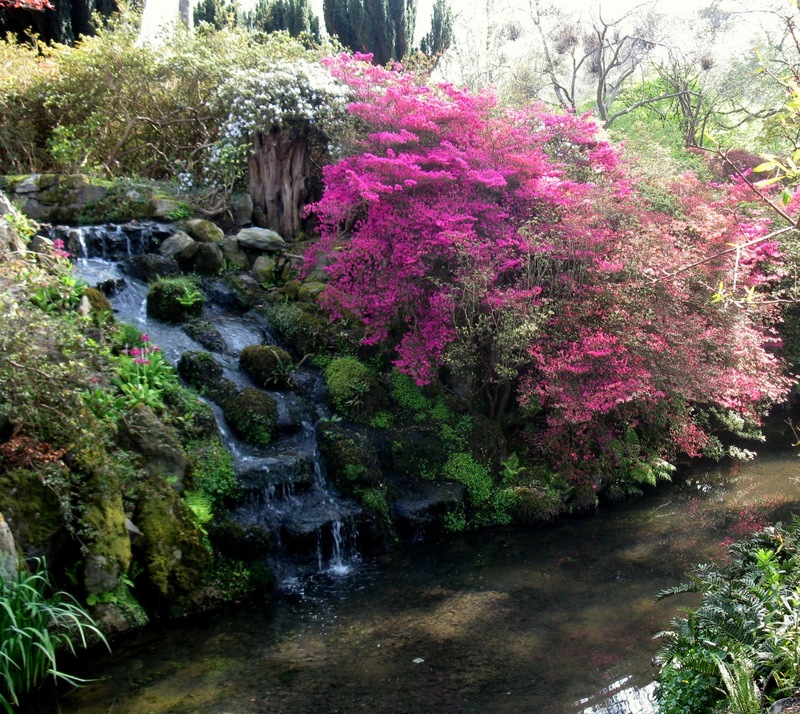 This is the finale for me and for which, amongst everything else in this magnificent place, Bodnant Garden is famous. Almost time to leave, but first I visit the excellent restaurant to enjoy some welcome and delicious refreshment. 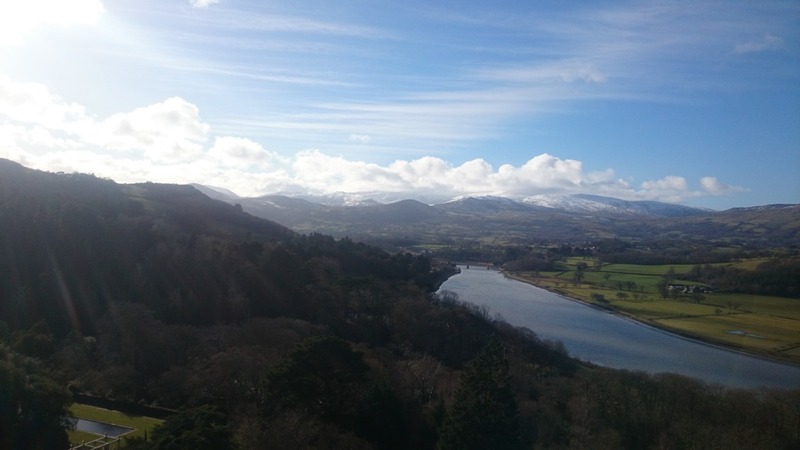 A perfect ending to a very special day spent amongst the sighing, whispering, magnificent trees and the glorious kaleidoscope of colours in this area of Outstanding Natural Beauty beside the stunning mountains and coastline of Snowdonia National Park. 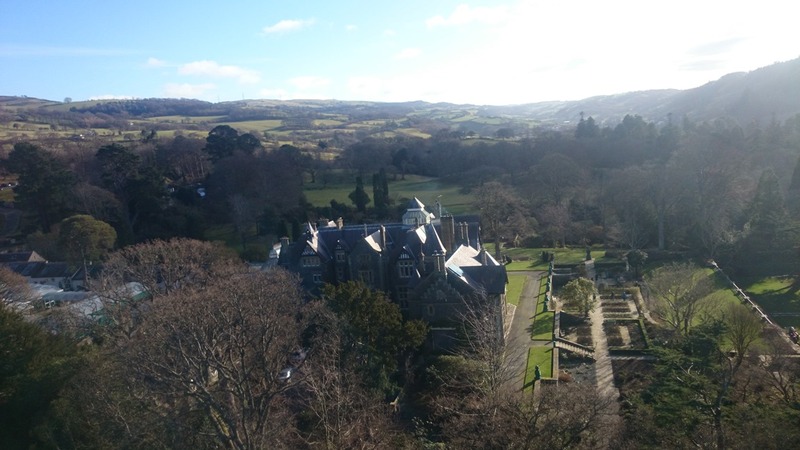 A big Bodnant Garden thank you to Rosie for sending us this account of her visit last year. 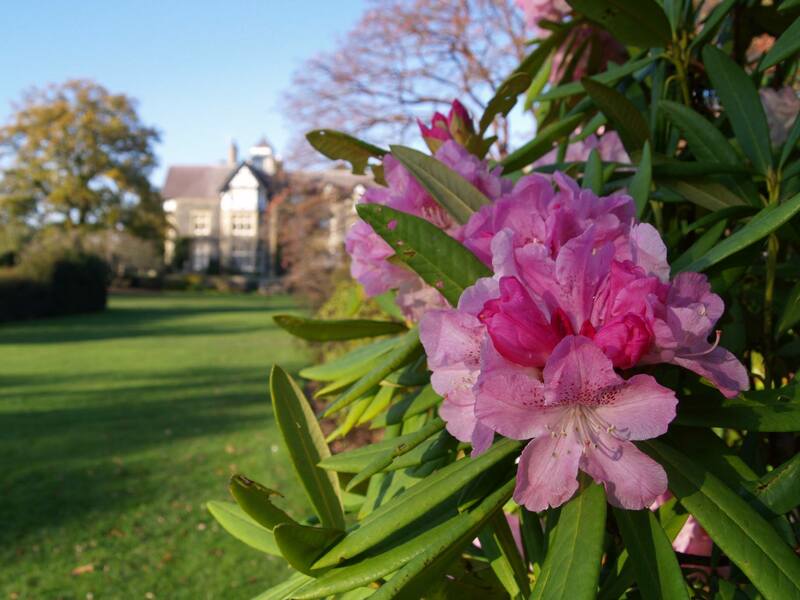 We’re opening the gates of Bodnant Garden after hours for the first time. 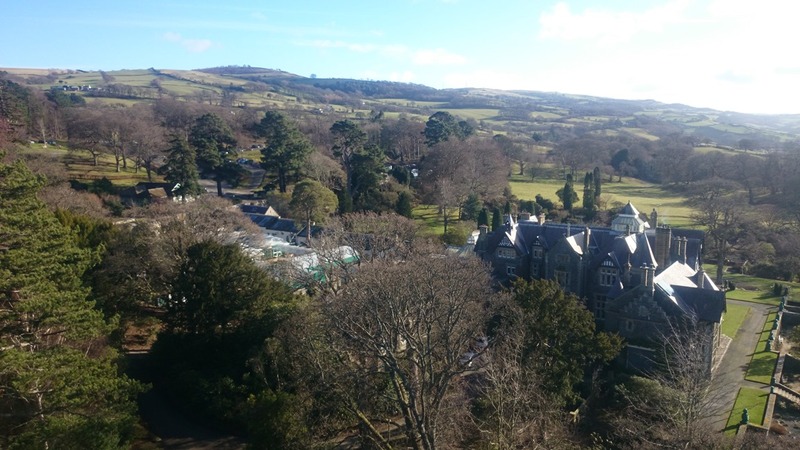 Come and enjoy the sights and sounds of the garden as never before, with a glass of wine to wash down the view! Imagine no longer! 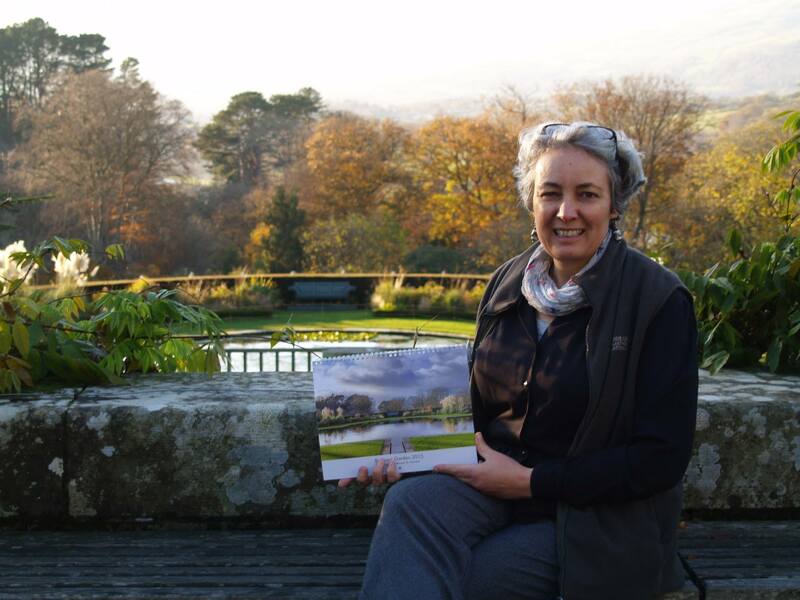 The experience could be yours to enjoy, take home and treasure if you come along to our new Walk and Wine evenings. We will provide the wine, canapés, music in the Pin Mill and even croquet on the lawn. 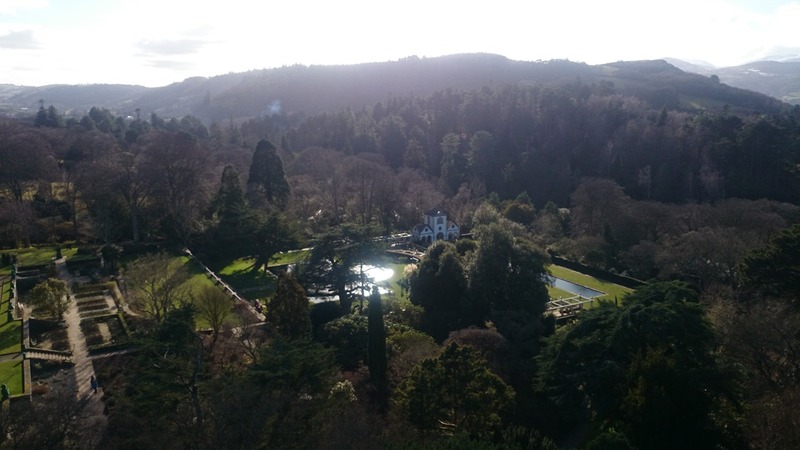 We can’t absolutely promise you a fine evening of course, but what we can offer is a chance to see the garden as never before when the landscape takes on a completely different ambience – a chance to enjoy our plants, trees and magnificent views in the dusk light. Just chill quietly and enjoy the atmosphere…or bring friends and pretend you’re at a country house garden party of old – Jeeves and Wooster, or Agatha Christie style (without bloodshed, hopefully). It is the first time we have opened the garden to the public in the evenings. The idea came from our student gardener David Green who had a light-bulb moment when leaving work last summer. Walk and Wine events will take place monthly through the summer on Thursdays April 25, May 30, June 27, July 25 and August 29, when you can enjoy the full, sophisticated al fresco experience. There will also be an opportunity to see inside the Pin Mill building which will be open to the public and of course the whole garden will be open to visitors for strolling. In addition, we will be having informal weekly late night openings on Wednesdays in May and June, from 5pm to 8pm – the May dates will be open to dog walkers too. 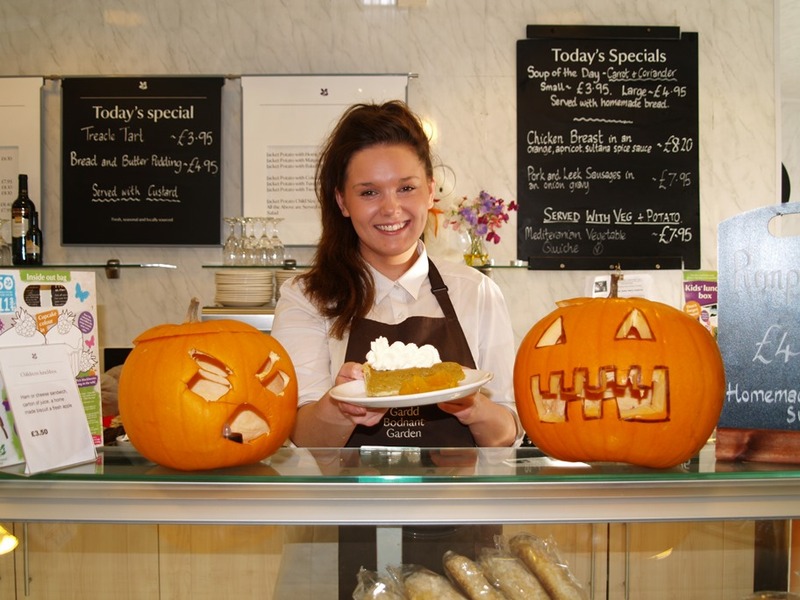 Regular admission charges apply for the Wednesday late night openings.